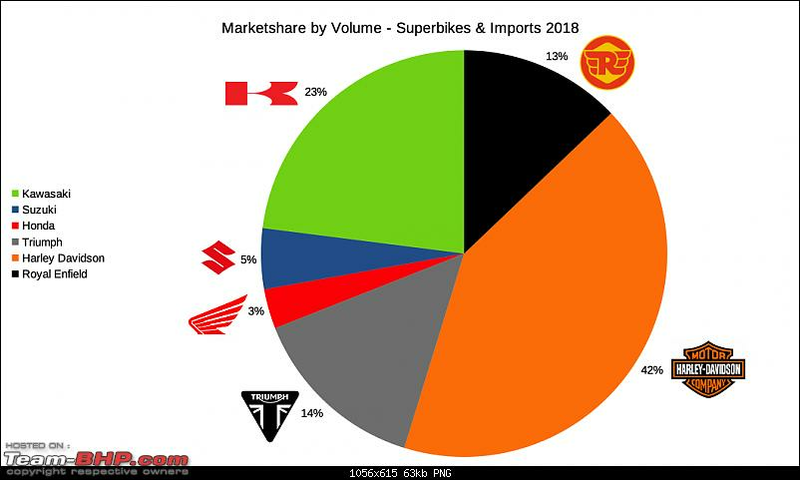 The low volume market for Superbikes and Imports in the country doesn’t allow for a meaningful monthly analysis of their sales data. 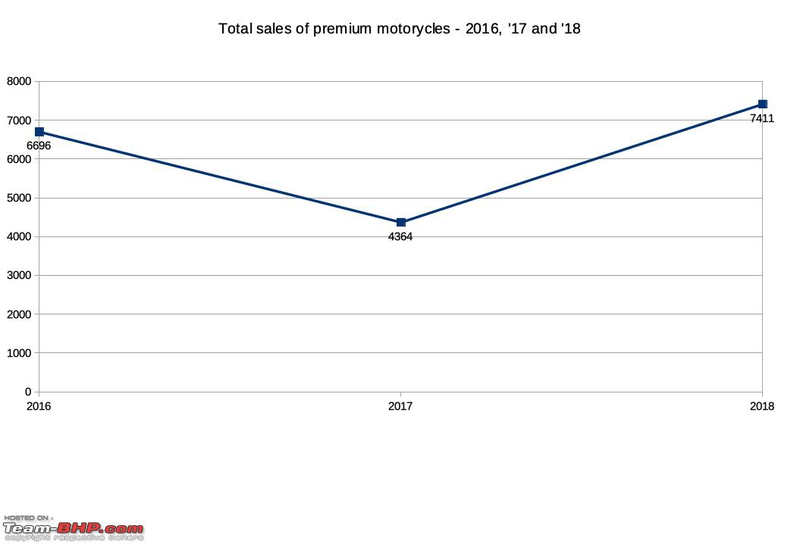 However, the same over a longer period of a full year makes for a healthy discussion - and with that goal in mind, below is the 2018 annual report and analysis of the premium two wheeler market in India. Manufacturers like BMW Motorrad, Ducati etc are not included because data is not available. 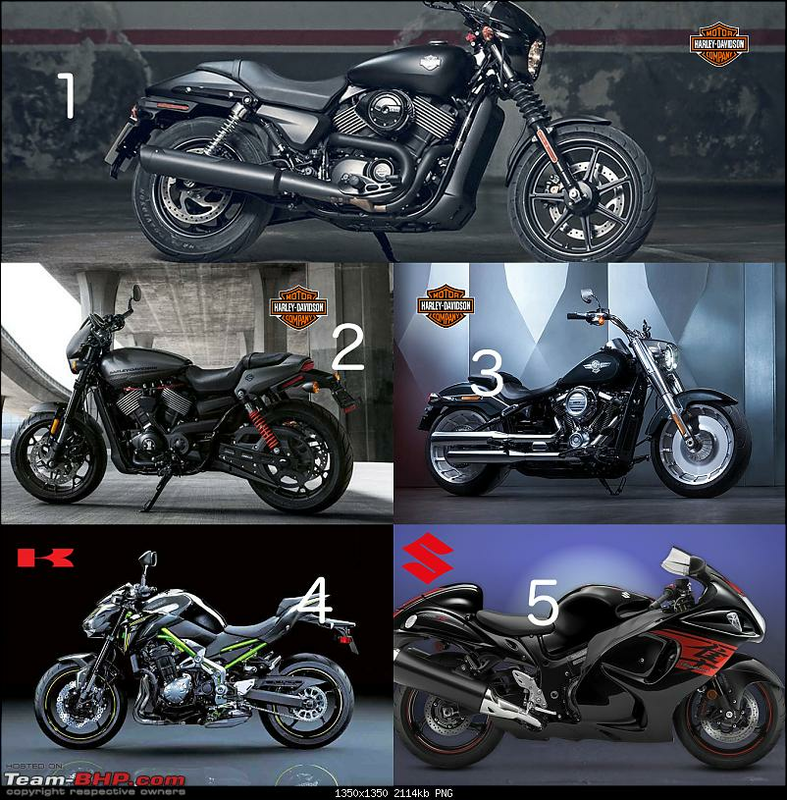 Four entry level twins take the top spots - Harley Davidson Street 750 at 1st place, Royal Enfield 650 Twins at second place (Two months of dispatch), Harley Davidson Street Rod at 3rd place and Kawasaki Ninja 650 at 4th. 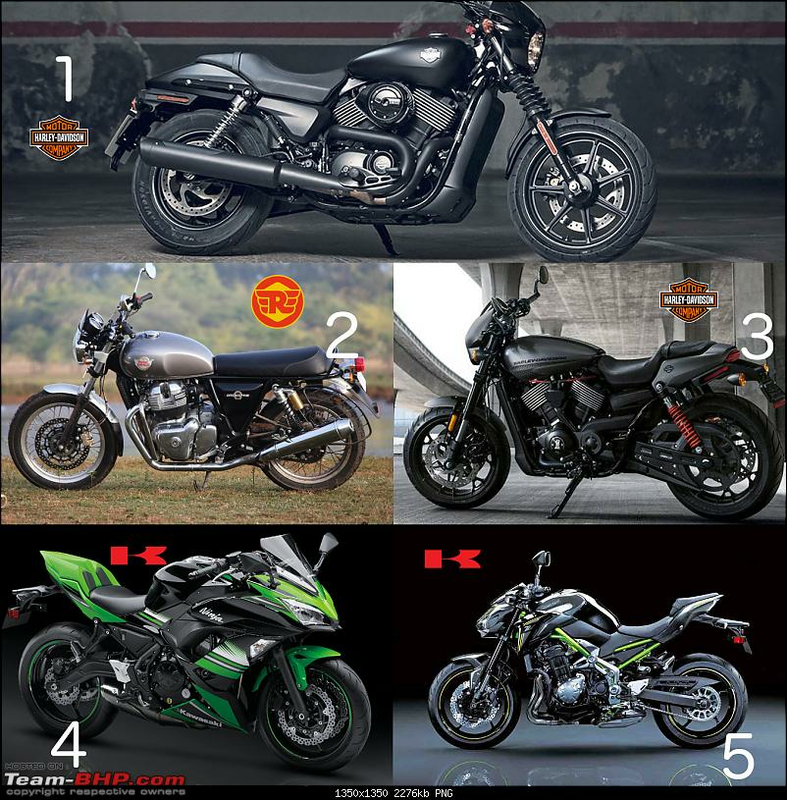 Bringing an inline4 presence into the top rankings is Kawasaki's Z900 at 5th place. 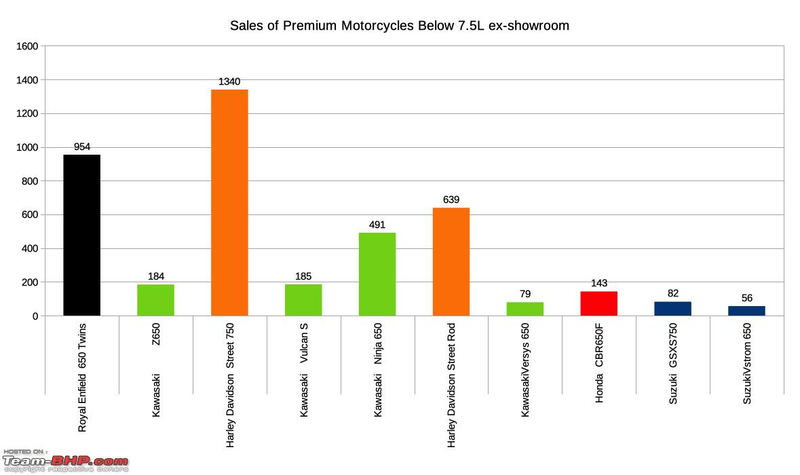 Selling 1340 units and with a price tag of 5.33 lakhs ex-showroom, Harley Davidson Street 750 takes the top spot. 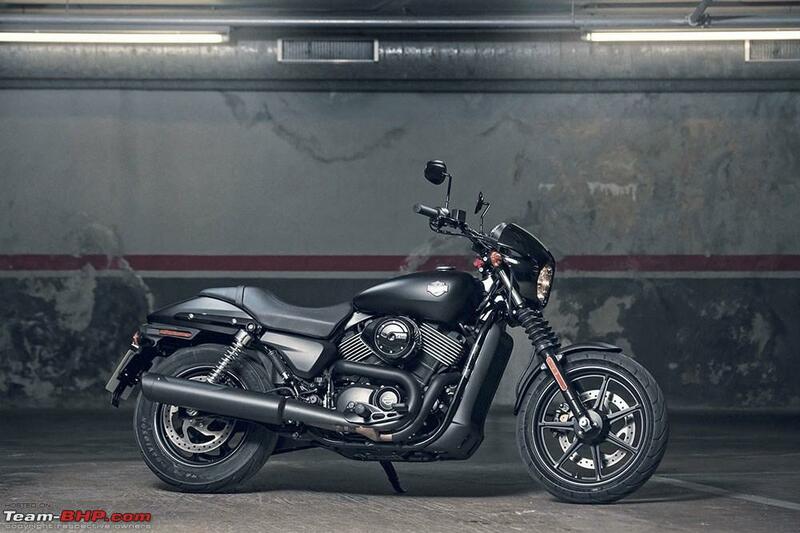 Selling 639 units and with a price tag of 6.53 lakhs ex-showroom, its the Harley Davidson Street Rod in 2nd place. Selling 195 units and with a price tag of 18.17 lakhs ex-showroom, Harley Davidson Fat Boy takes 3rd place - the most expensive bike in the Top 5 list. 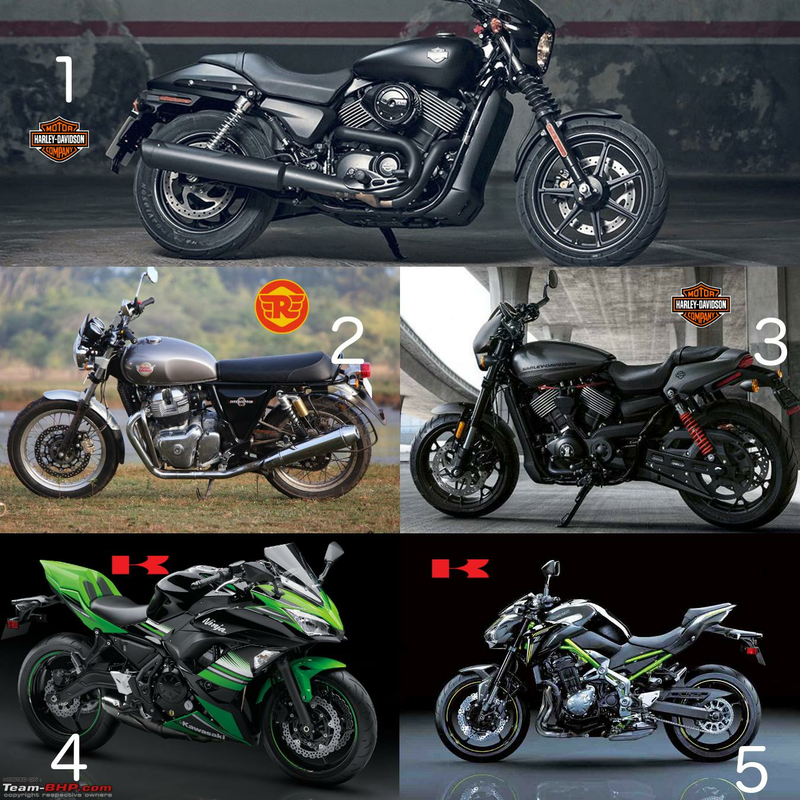 Selling 393 units and with a 7.68 lakhs ex-showroom tag, Kawasaki Z900 takes 4th. 13.74 lakhs and 216 units brings the evergreen Hayabusa into 5th place, quite an achievement in its penultimate year of production. Last edited by CrAzY dRiVeR : 27th January 2019 at 17:22. 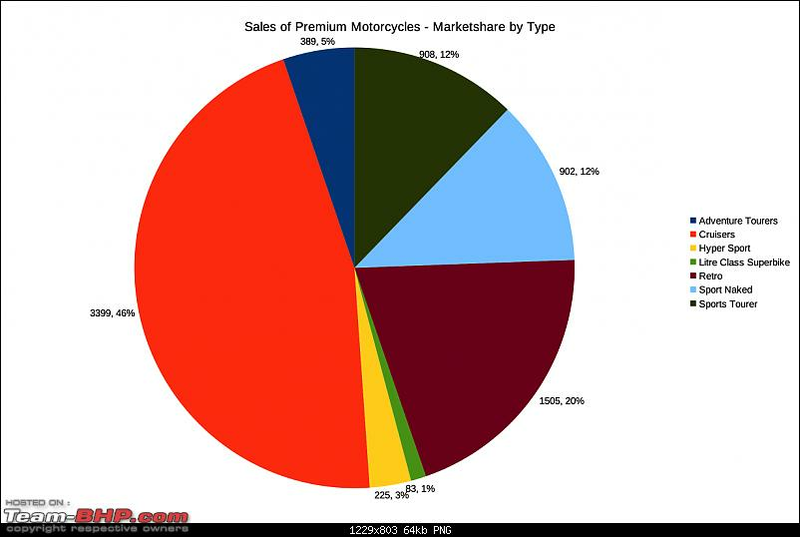 Harley Davidson has the clear majority when it comes to numbers - capturing 42% of sales in the premium motorcycle market. 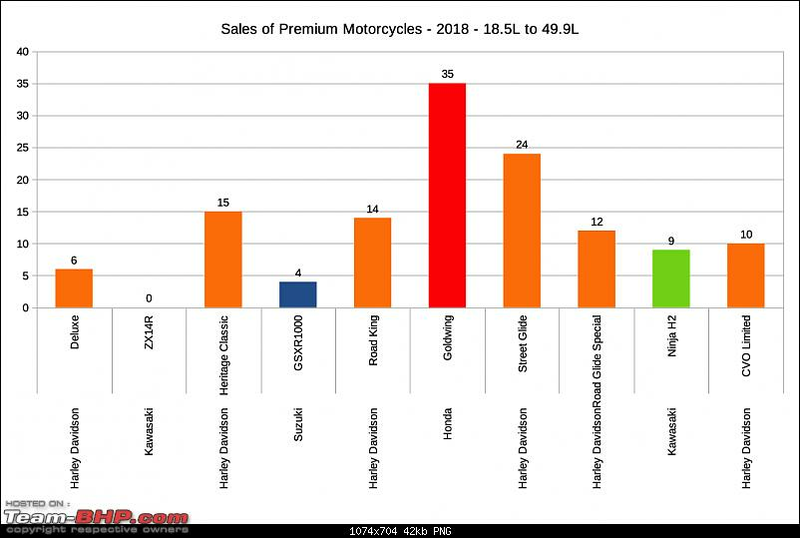 Royal Enfield with only two months of dispatches secures a position ahead of the two Japanese majors - with 13%. 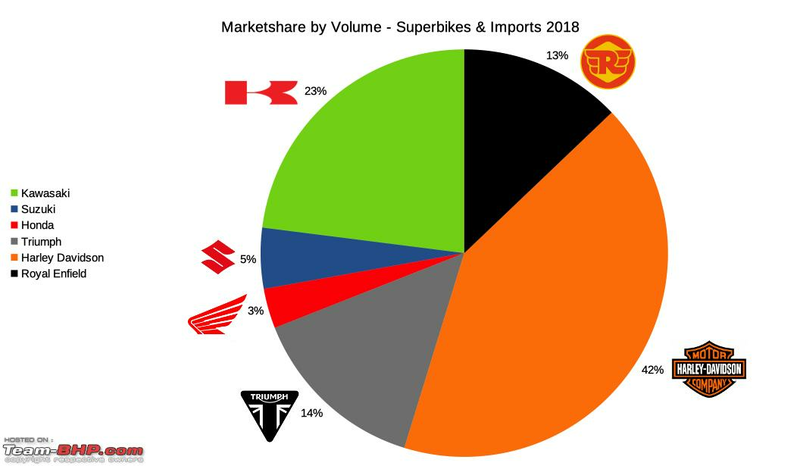 Kawasaki registers growth of 124% as compared to 2017, and 80% as compared to 2016. 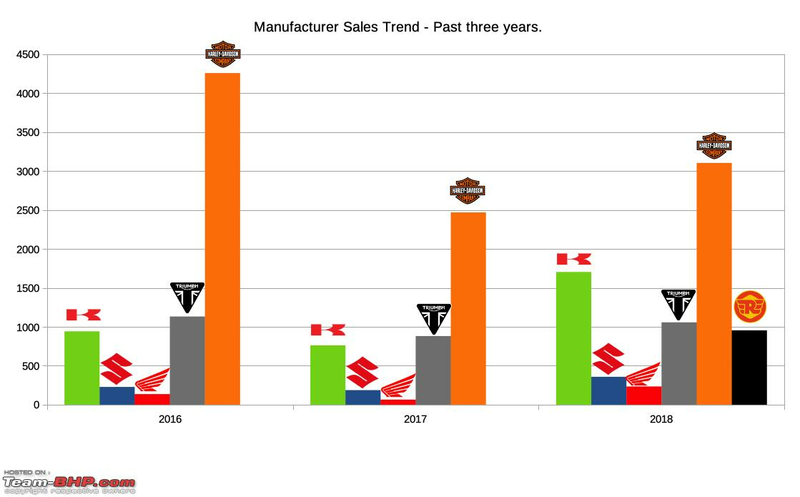 Harley Davidson achieved 26% growth as compared to 2017, but is still 27% less than what they achieved in 2016. Royal Enfield looks very promising indeed with just two months of dispatches giving the biggies a run for their money - of course, with the advantage of the product being made in India. Numbers change when it comes to revenue, as RE could capture only 4% in terms of revenue, from 13% marketshare in volumes. Harley and Triumph pulls ahead here, thanks to the middleweights doing all the hard hitting, whereas Suzuki also pulls ahead thanks to the Hayabusa. Honda should be thanking the Goldwing + the Africa Twin. Last edited by CrAzY dRiVeR : 27th January 2019 at 15:26. 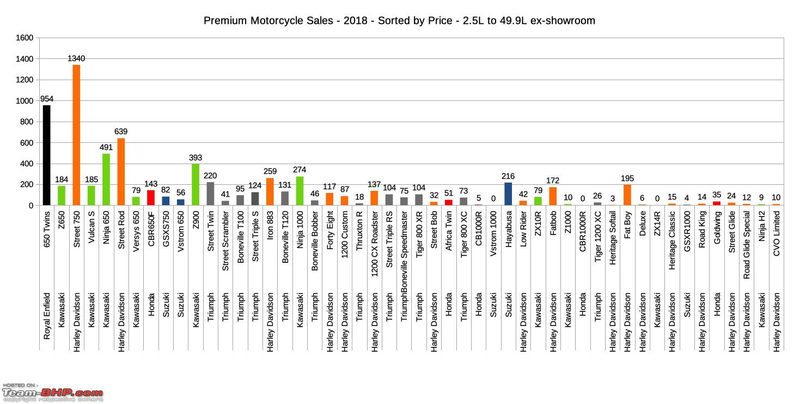 Premium Motorcycle sales - Sorted by price. I personally found this particular graph very interesting because it gives a picture of which products have really caught the fascination of the market, at various price points. If the wholistic picture is a bit hard to decipher, price bracket classified graphs are provided below as well. 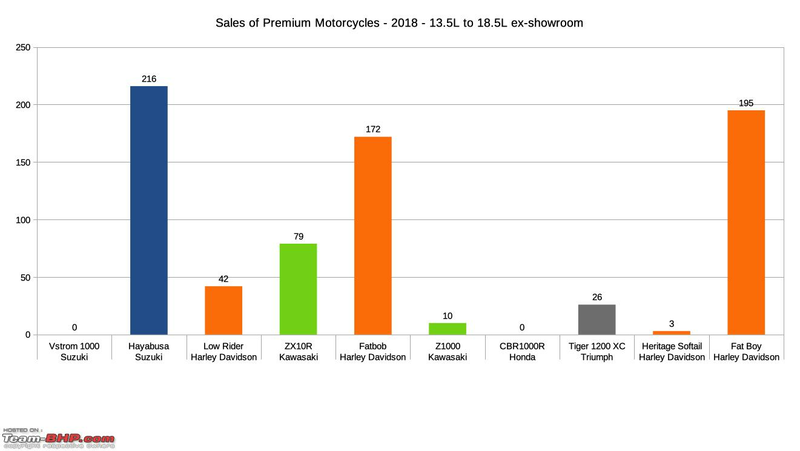 Note - The leftmost product is 2.5L ex-showroom, whereas the rightmost product is 49.5L ex-showroom. 10 units of Harley Davidson CVO, a motorcycle that had a pricetag of 49.5L ex-showroom last year. 9 units of Kawasaki Ninja H2, a motorcycle worth 34.5L ex-showroom. 35 units of Honda Goldwing, despite the 27.7L pricetag. 195 units of Harley Davidson Fatboy worth 17.7L, as mentioned in the opening post. 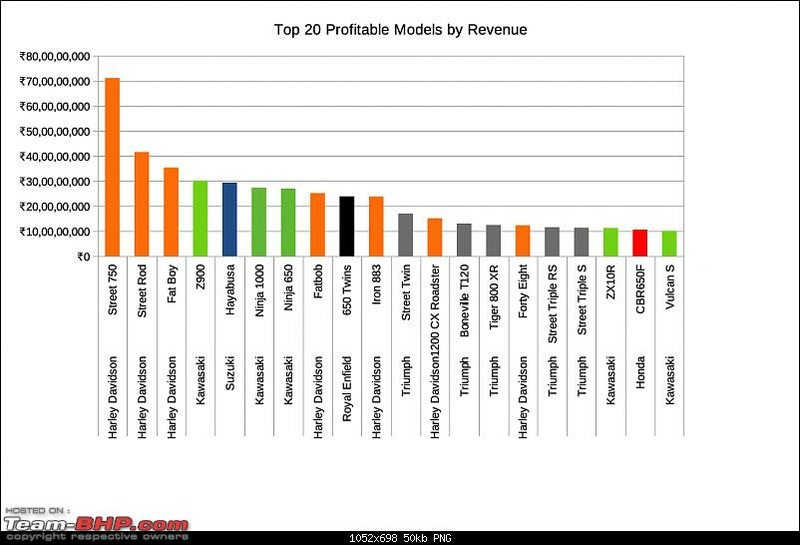 It even comes in the top 5 when it comes to revenue earning machines. 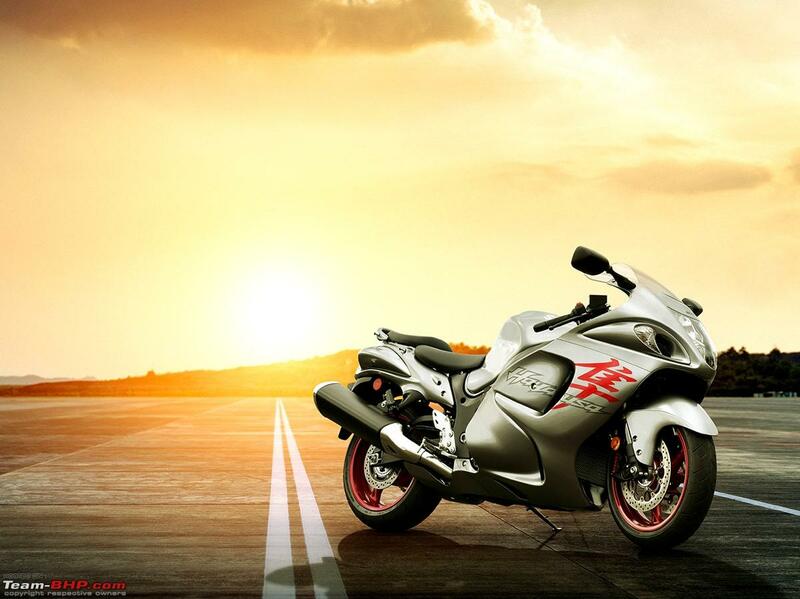 216 units of the evergreen Suzuki Hayabusa worth 13.6L. 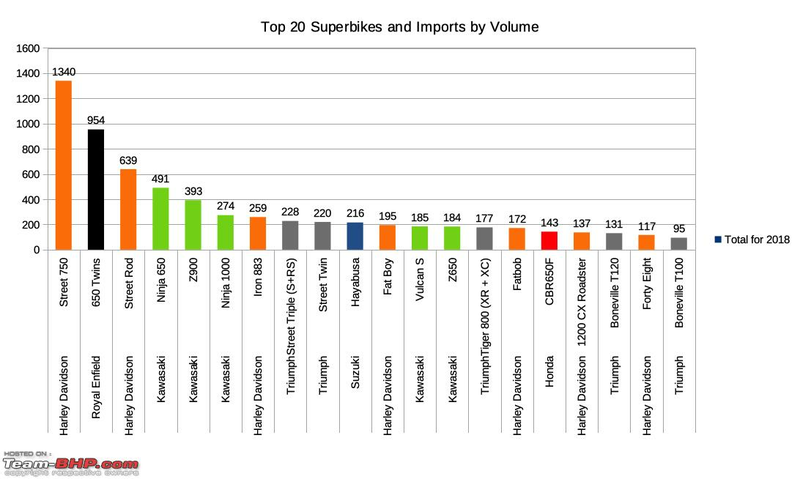 274 units of the 9.99L Kawasaki Ninja 1000. Last edited by CrAzY dRiVeR : 27th January 2019 at 15:37. 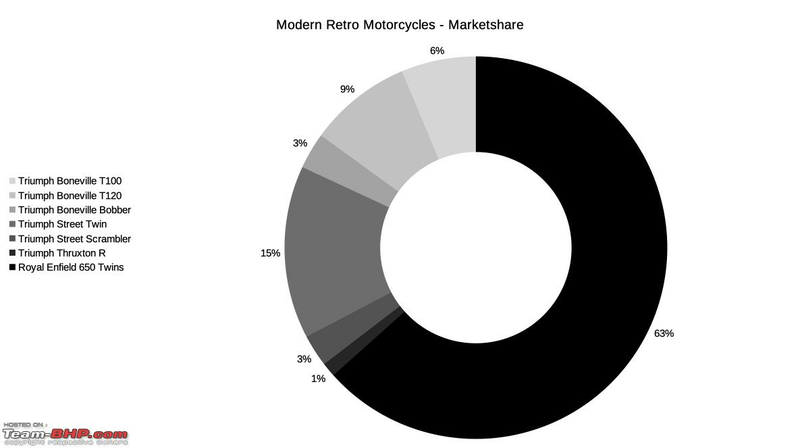 Marketshare details - by segment and type of motorcycles. 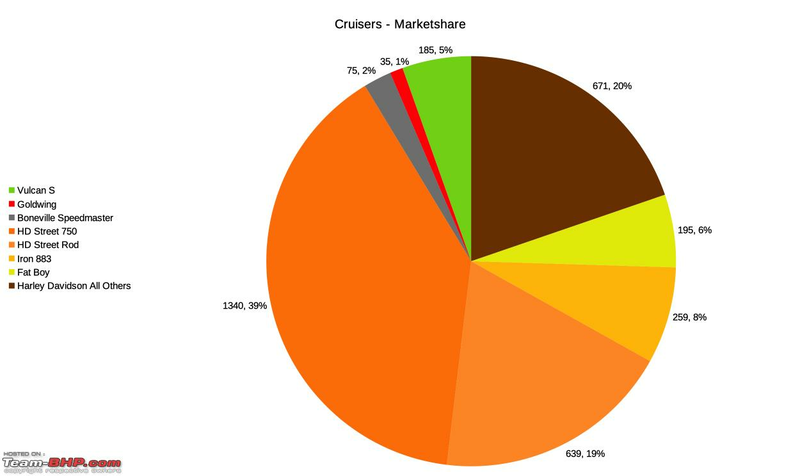 Cruisers are the market favourites (Thanks to Harley Davidson) with 46% market share. 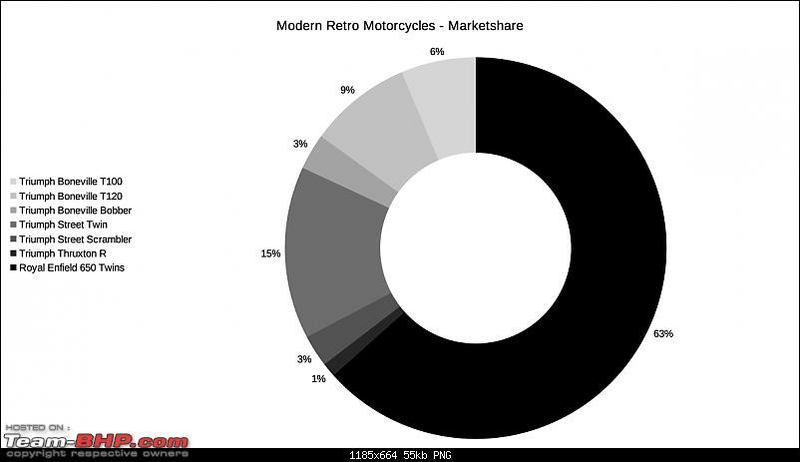 Thanks mainly to Royal Enfield, Retro Classics take second place with 20% market share. 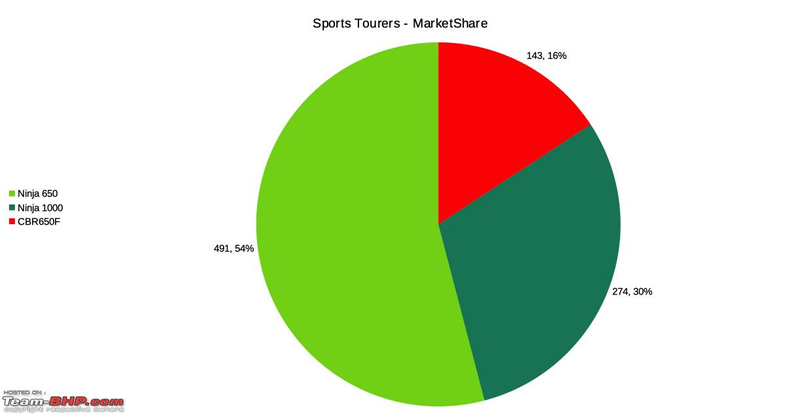 Sports tourers and sports nakeds compete neck to neck for marketshare, both grabbing 12% of the pile. 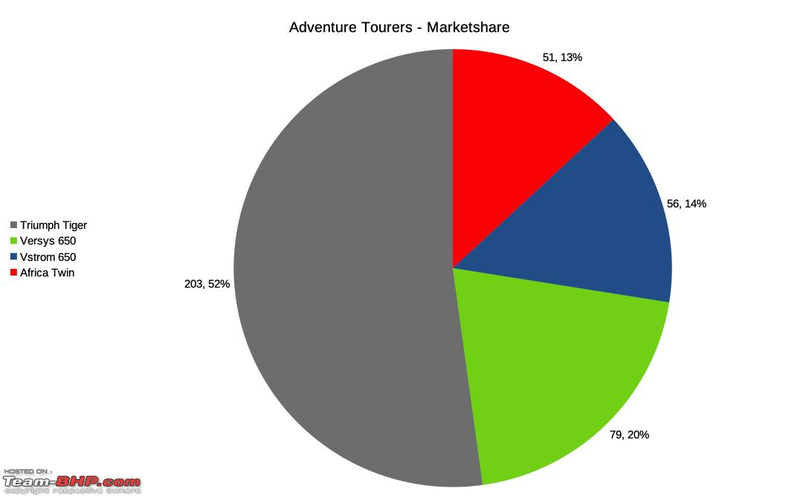 Adventure tourers are limited to 5% even though they are gainly popularity recently, whereas Hypersports have 3% marketshare thanks to the Hayabusa. 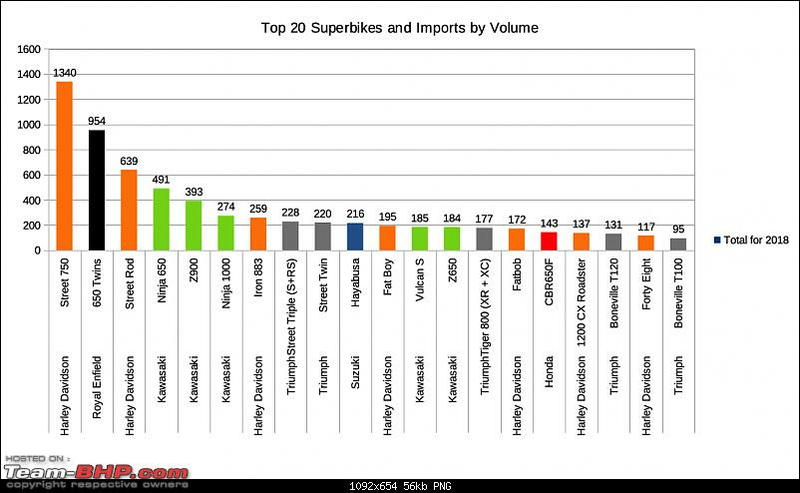 Least popular option is infact the most desirable one - the Litre Class Superbike, which only manages to post a respectable figure due to the recent entry of the CKD Kawasaki ZX10R. A wise man in my friend circle once said that every adventure tourer would have considered the Triumph Tiger at some point of his purchase. 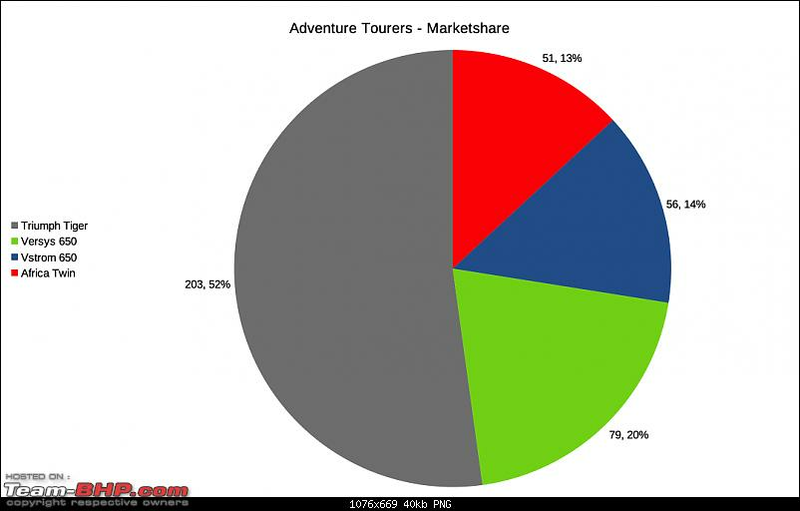 True indeed, Tiger range (XR and XC together) have 52% marketshare when it comes to ADV motorcycles. Kawasaki Versys had a dream run in 2016 and 2017, but it surely has run out of steam recently. Still good enough to grab second place in 2018 though! Suzuki VStrom 650 has taken the limelight, and is surely promising to be a decent seller for the brand in India. 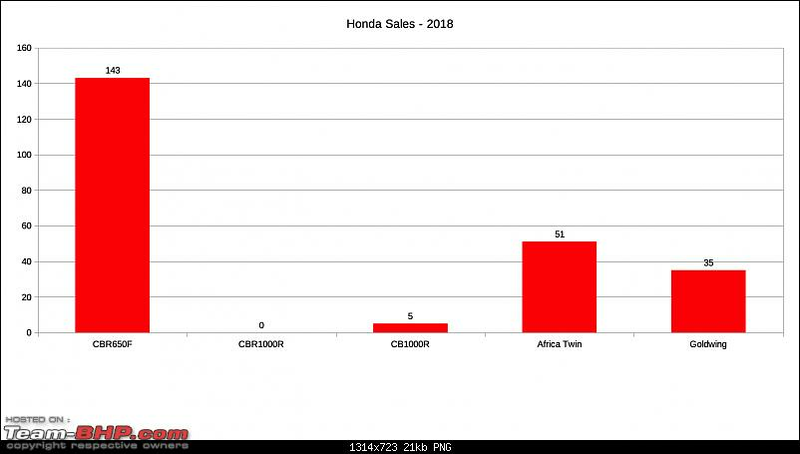 Honda Africa Twin received high praises and was supposed to single handedly crush this market - but thanks to limited allocations from Honda - it takes last place in reality. All that bright Orange means only one thing - its Harley Davidson all the way. 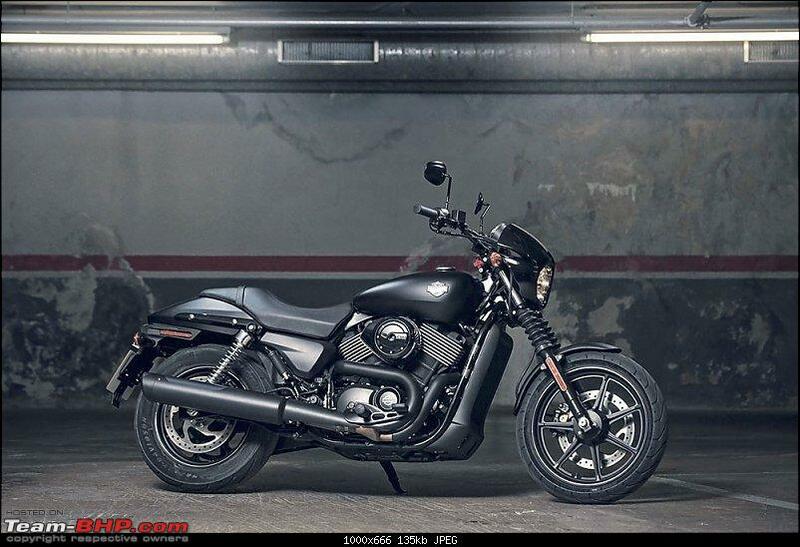 Kawasaki Vulcan S posed a small challenge with 5% marketshare, and Triumph Speedmaster 2%. 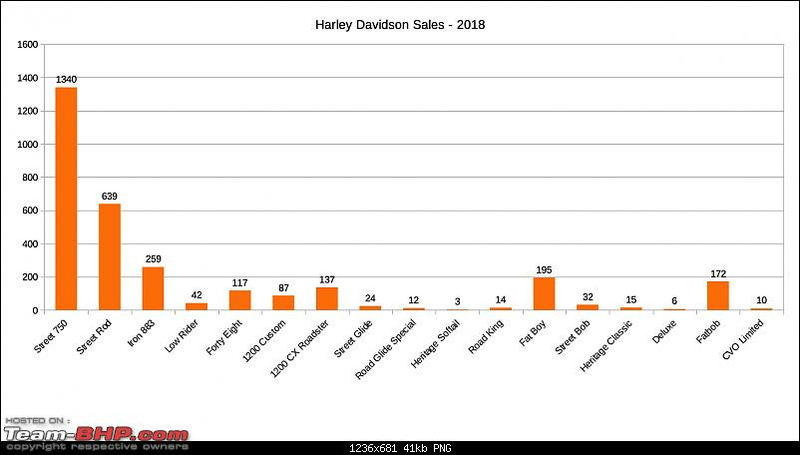 What would have really caught Harley's attention is the 1% taken by Honda. 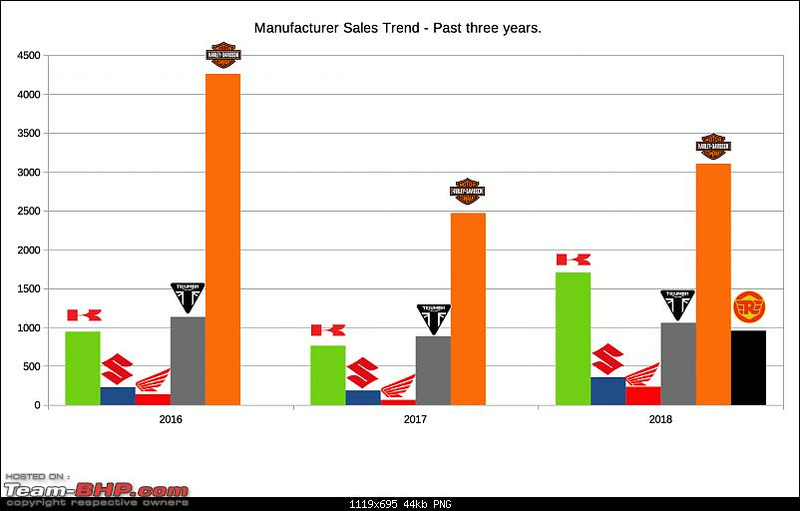 Because those 35 units were of the ultra expensive Goldwings, which are clearly sales lost for high end Harleys. 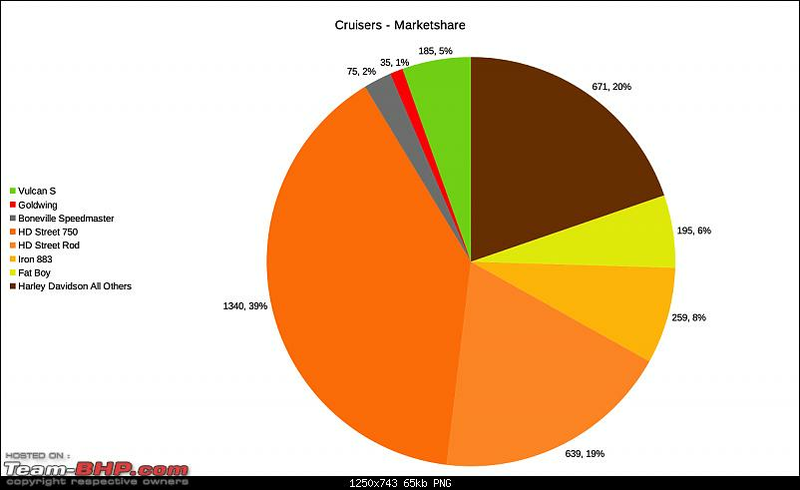 Triumph had a free run in this market till Royal Enfield came along and ruined their pie chart, grabbing 63% in just two months. Will be the most interesting scene to watch out for - in 2019. The story is about 3 default options in their respective categories. 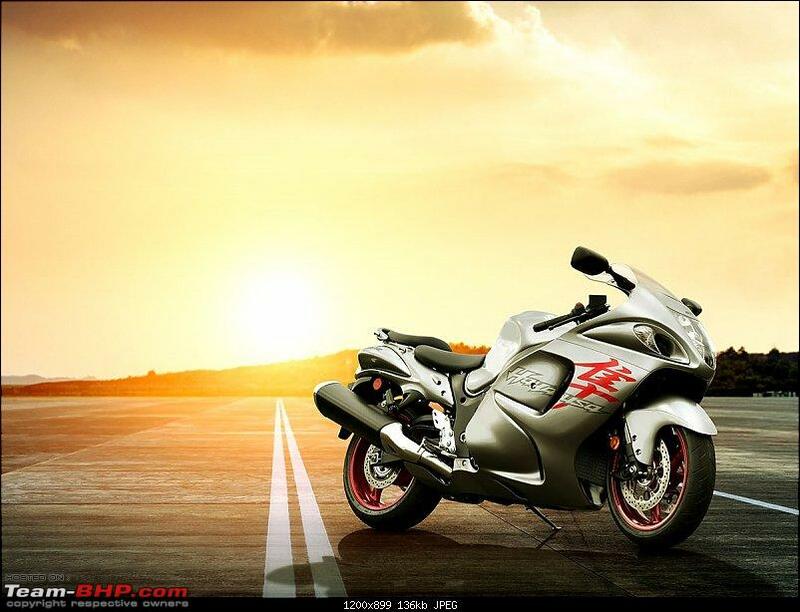 Hypersport - CKD Suzuki Hayabusa. Ultimate nothing else compares machine - Kawasaki Ninja H2. 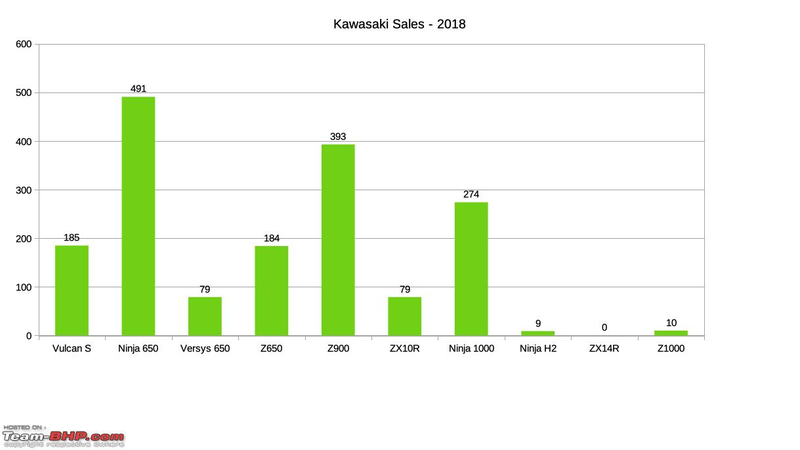 Kawasaki has the strong hold when it comes to sports tourers with 54% of the market held by the Ninja 650, and 30% by the Ninja 1000. 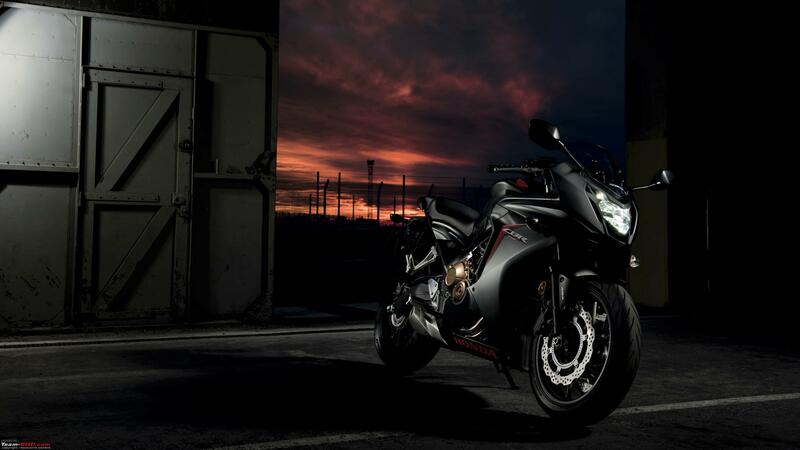 Honda has 16% with the CBR650F, but the upcoming 650R will surely be a contender to watch out for! 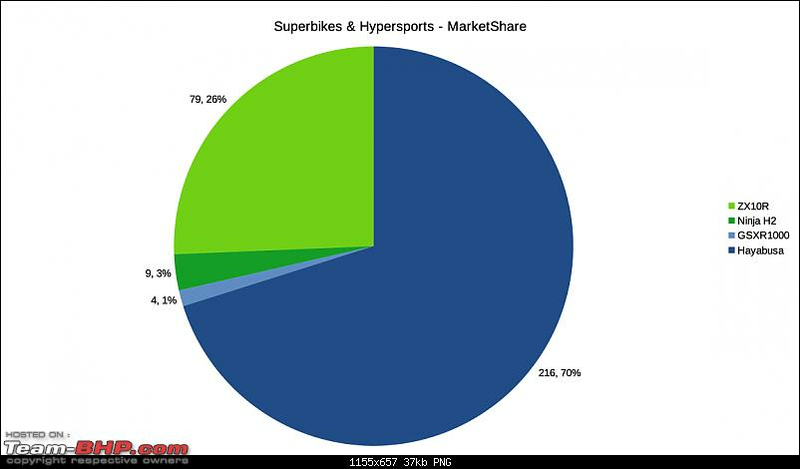 Kawasaki once again has a stronghold on the Sports Naked market - with the Z900 capturing 44% marketshare. 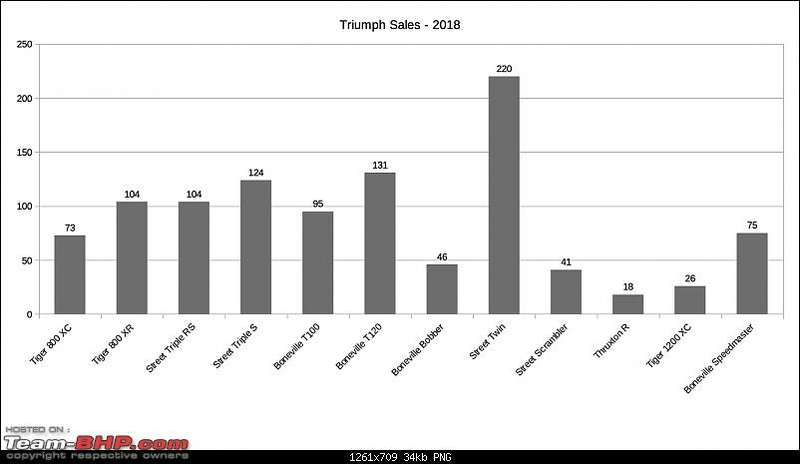 Triumph Street Triple in its new avatar has given tough competition - with 26% marketshare coming from both it's versions combined. 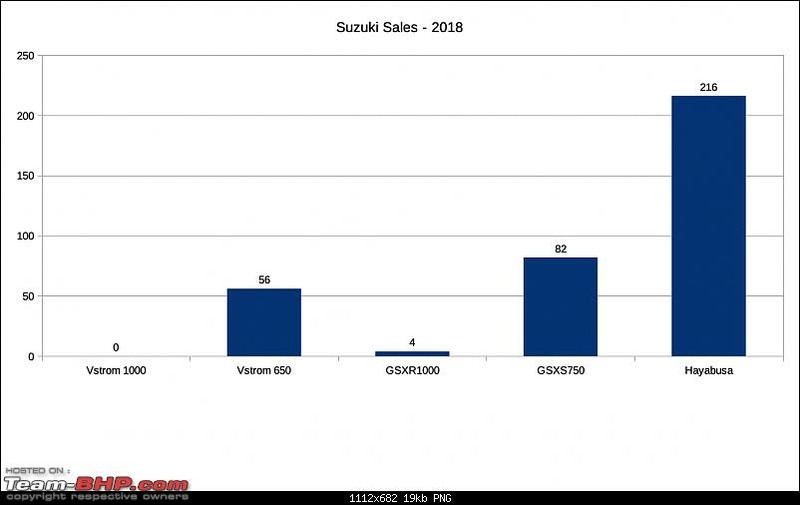 Suzuki has 9% of the market with its GSX-S750. Harley Davidson is the industry leader and had a 26% growth when compared to last year, though their performance in 2016 was far better. 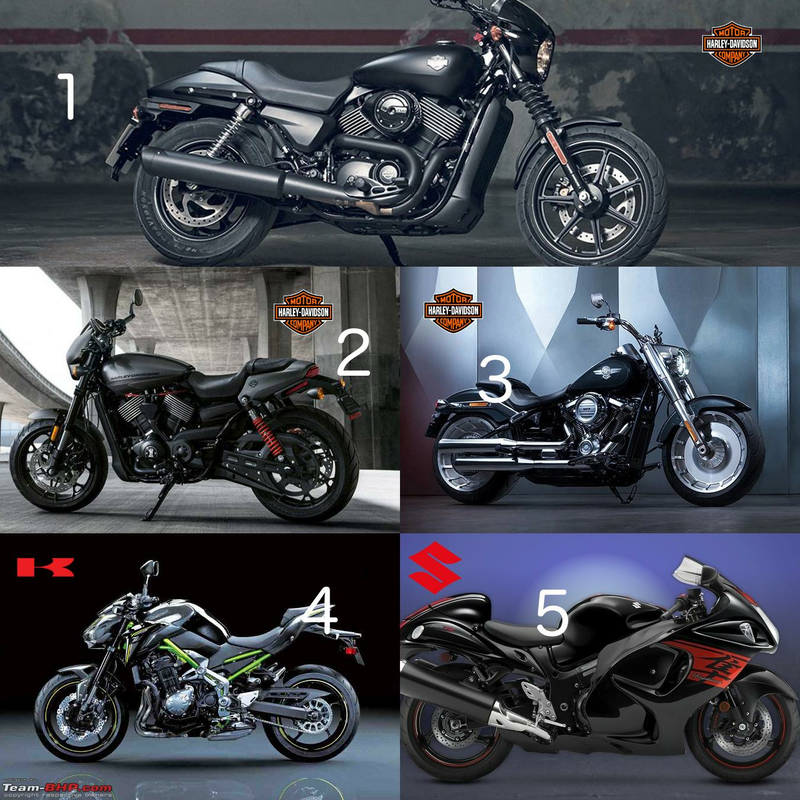 The entry level Street 750 and Street Rod motorcycles remain the company best sellers, selling 1340 and 639 units respectively. 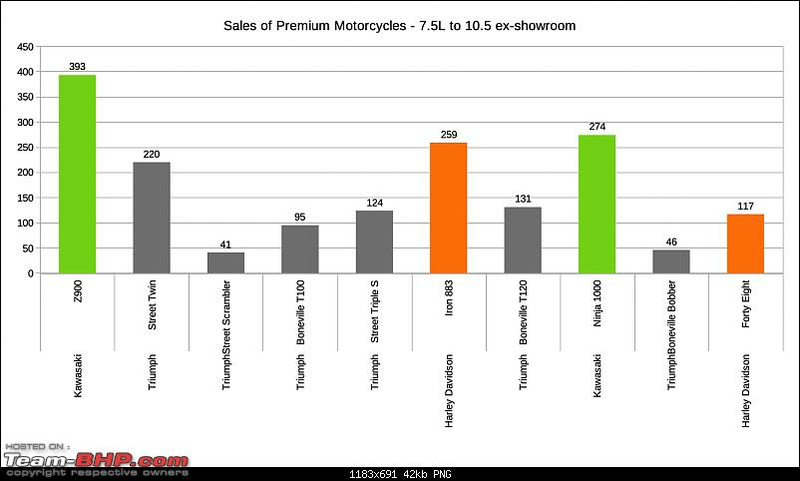 Iron 883 (259 units), 1200 CX Roadster (137 units), Forty Eight (117 units), 1200 Custom (87 units) bring in decent volumes as well. Harley Davidson Fatboy and Fat Bob sell exceptionally well given the price points. Fatboy still remains 'THE' Harley Davidson for many. 10 units of the 50 lakhs worth CVO Limited is another achievement!. Last edited by CrAzY dRiVeR : 27th January 2019 at 15:46. Kawasaki was the most aggressive player during 2018 and the 124% growth speaks as a testament to this. 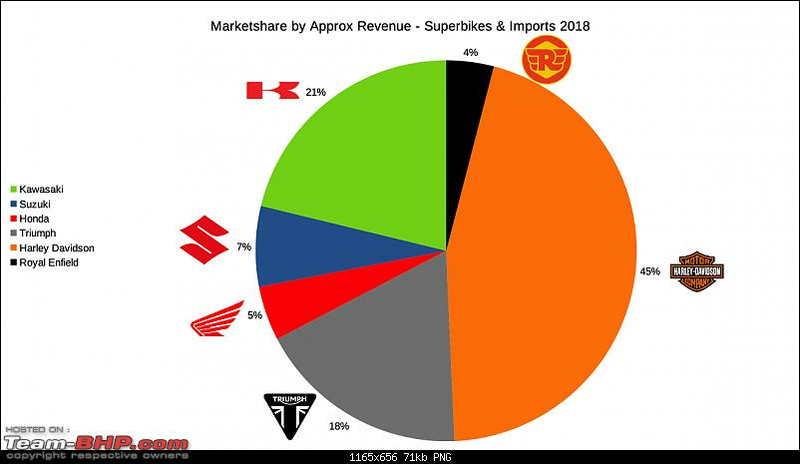 The company sold 2665 motorcycles in 2018, of which 1704 motorcycles (Or 64% of sales) were from premium category. 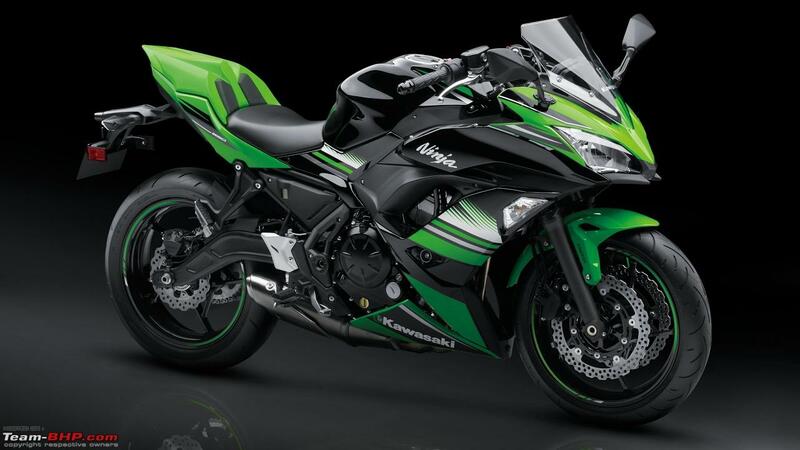 The entry level 650 platform brings in maximum numbers for Kawasaki with the Ninja 650 at 491 units and Z650 at 184 units. Versys 650 had a good run till it ran out of steam mid 2018. Vulcan S brings 185 units too. Z900 at 393 units takes the pole position for India's best selling inline4! 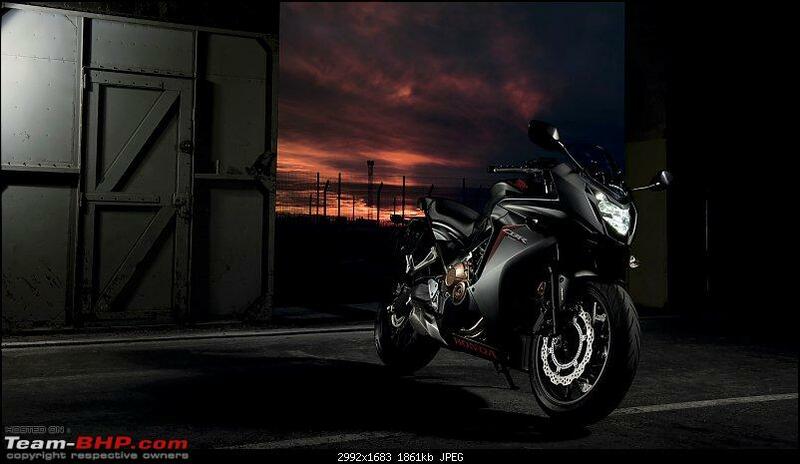 Ninja 1000 was introduced as CKD with a brilliant 9.99L price tag, and brings home 274 units for Kawasaki. ZX10R as CKD was another masterstroke and at 74 units - it is way ahead of the competition. Finally - 9 units of the supercharged Ninja H2! Last edited by CrAzY dRiVeR : 27th January 2019 at 15:49. 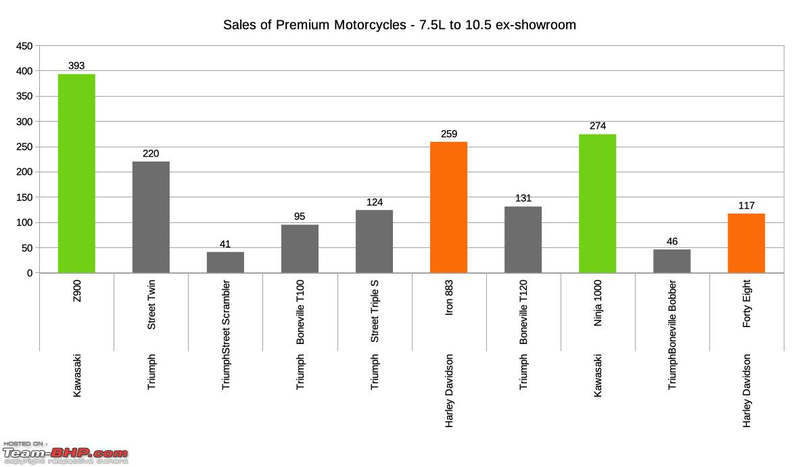 Triumph deals only with premium motorcycles in India, although this could change in the coming years with their Bajaj tie-up. 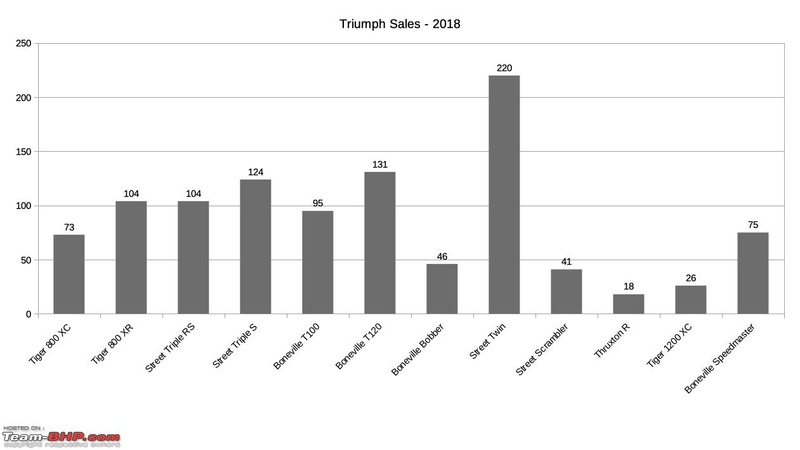 Tiger is the most valuable brand for Triumph in India (considering the price range as well) - with the XR variant selling 104 units and the offroad capable XC variants selling 73 units in 2018. The top of the line Tiger - 1200XC sold 26 units last year. Street Twin sold 220 units in 2018 and is the best seller for the brand. 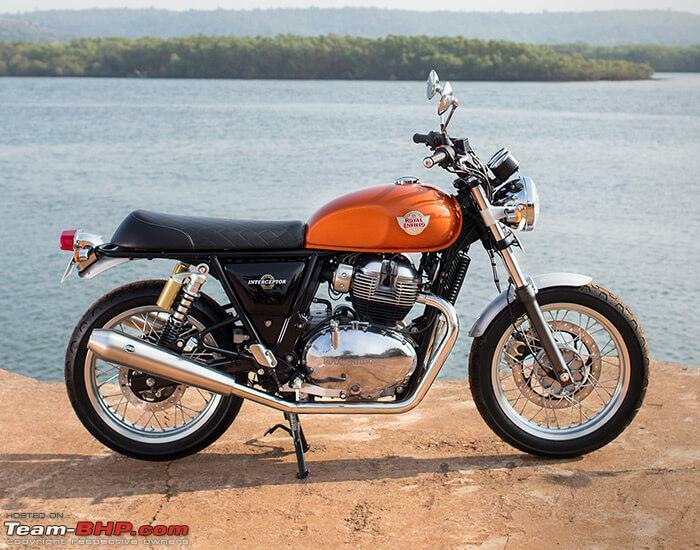 However, 2019 is going to be interesting for the Street range due to the introduction of Royal Enfield 650 range. Boneville family forms the backbone of Triumph sales in India. Apart from the Street Twin mentioned above, T100 and T120 sold 95 and 131 units respectively, whereas the Bobber and Scrambler sold 46 and 41 units respectively. Triumph's cruiser - the Boneville Speedmaster moved 75 units off the showroom floors in 2018. Street Triple range is considered one of the best street nakeds around - and sold 124 units of the entry level S variants and 104 units of the very capable RS variants. Last edited by CrAzY dRiVeR : 27th January 2019 at 15:50. 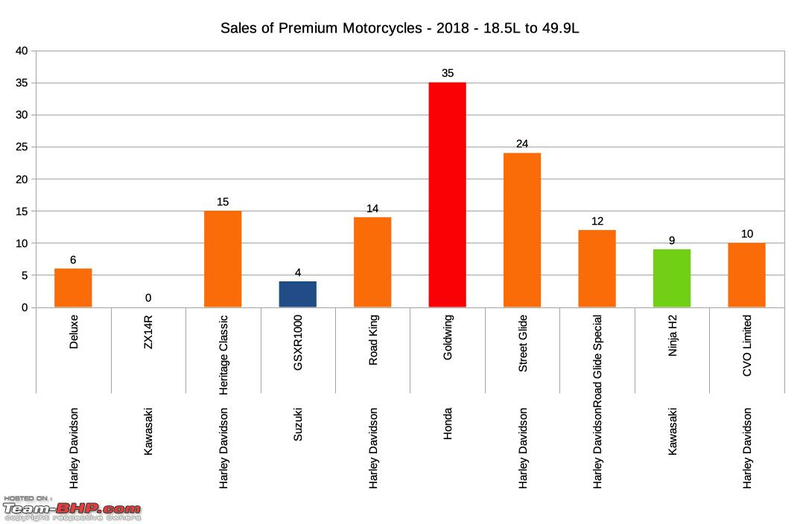 Royal Enfield's first foray into premium twin cylinder motorcycles has been well received worldwide, and with just two months of dispatches - the company is in 4th position in the Indian market. 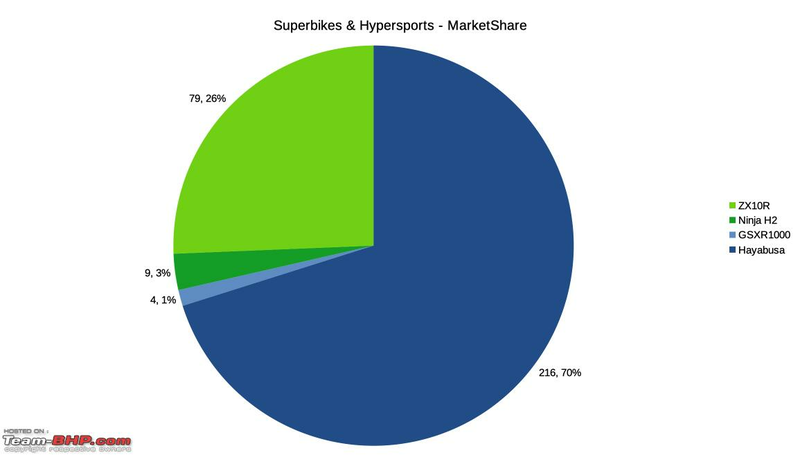 Too early to comment much on the market performance - but the 650 twins are expected to be the most disrupting performers in 2019. Last edited by CrAzY dRiVeR : 27th January 2019 at 15:52. 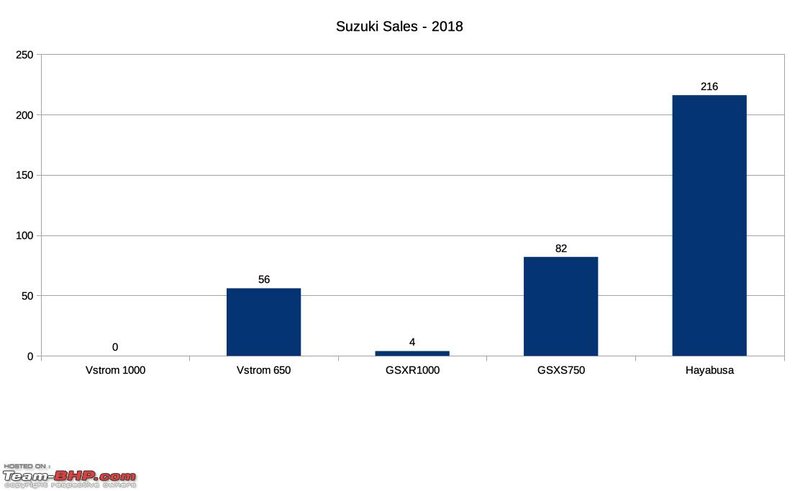 Bringing up 5th place is Suzuki with 358 units sold in 2018. 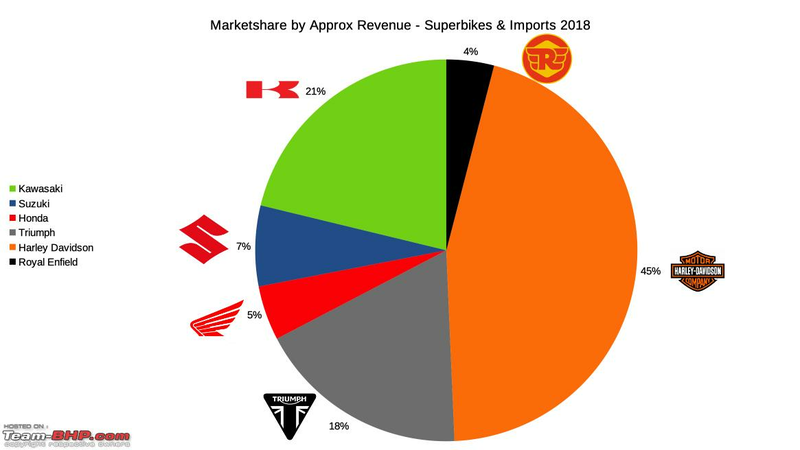 Incidentally - Suzuki is the 5th largest motorycle manufacturer in the country for 2018, having sold 6,27,978 motorcycles during the period. 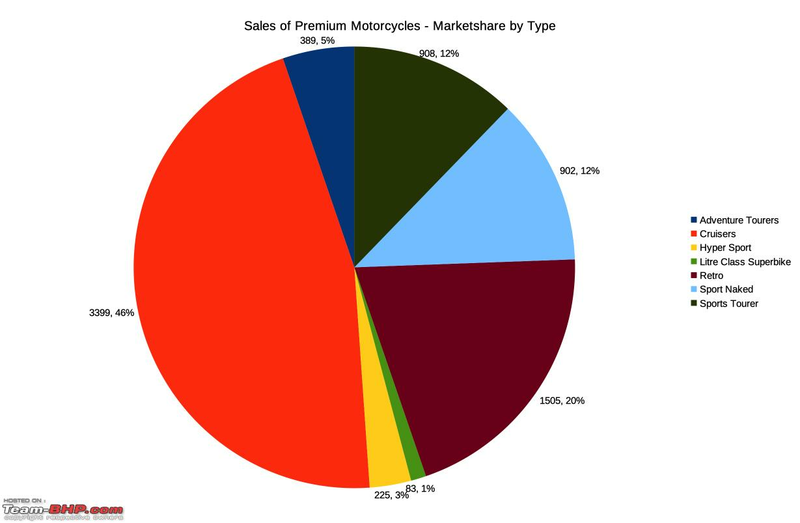 Yes, that means 0.057% of company sales came from premium motorcycles. 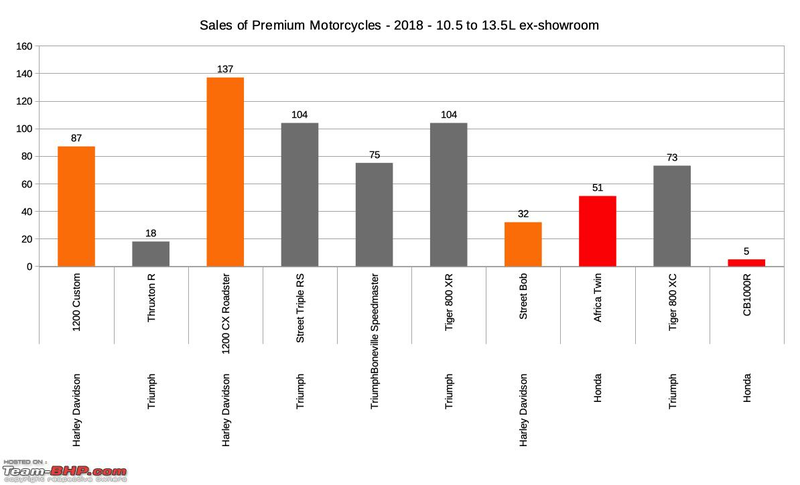 The good old 'Dhoom bike' is still the best seller for the company, in it's penultimate year of production - Hayabusa sold 216 units during the year, bringing it into 5th place among top sellers when revenue is considered. Both recent launches from Suzuki - the GSX S750 and VStrom 650 have been successful - with 82 and 56 units sold. Last edited by CrAzY dRiVeR : 27th January 2019 at 14:30. 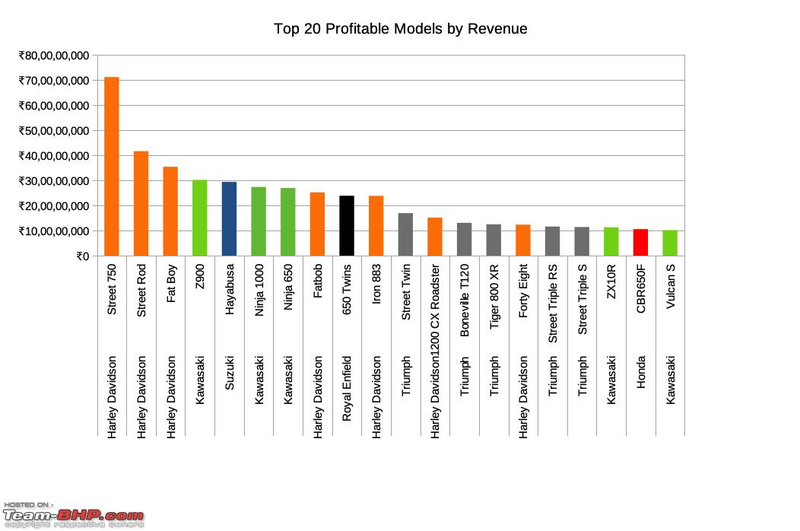 Taking the last position in this list is Honda, with 234 motorcycles and 3% of sales. Honda is the 2nd largest two wheeler manufacturer in the country. 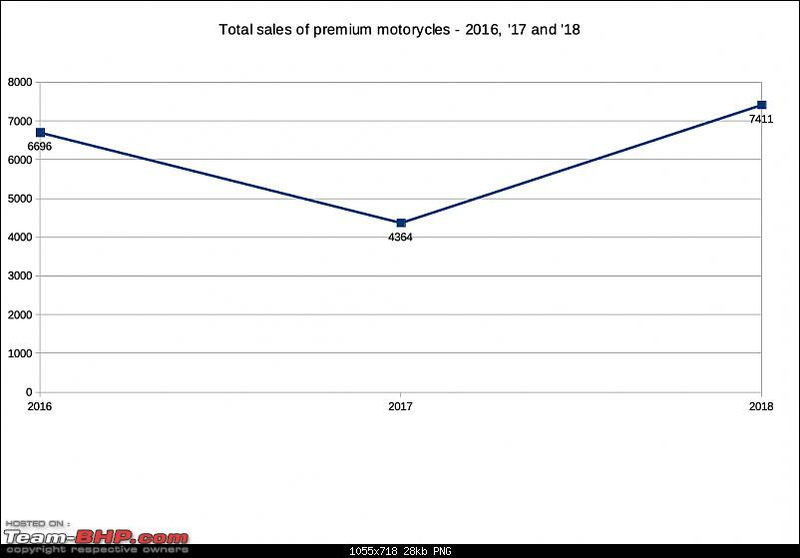 They sold 58,84,894 motorcycles during this period. 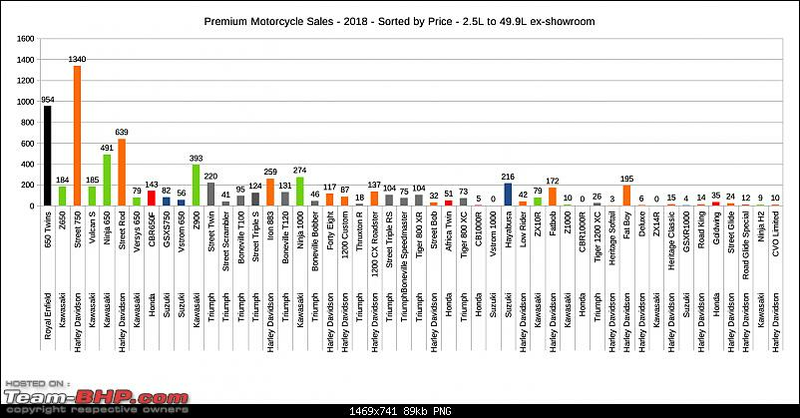 Yes, premium motorcycles account for just 0.004% of the sales numbers. Honda's sports tourer offering - the CBR 650F has been their biggest seller for 2018, with 143 units - and looks ready to have a competitive 2019 with the upcoming launch of it's latest iteration - the 650R. 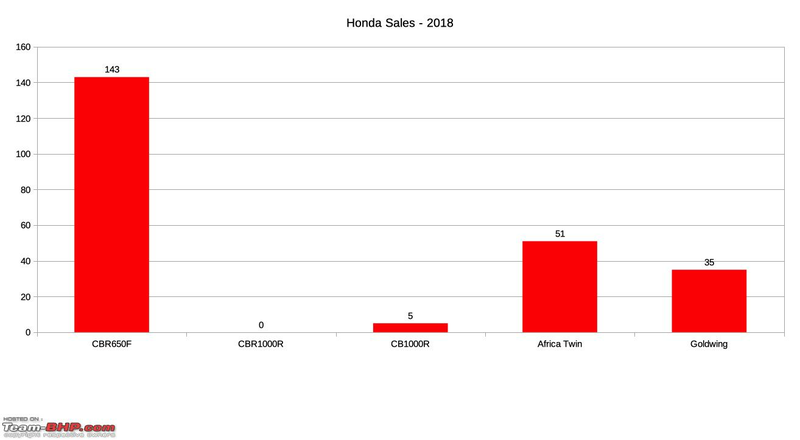 Honda Africa Twin is widely regarded as a very capable adventure tourer - but limited allocation from Honda for the Indian market means it sold only 51 units over the year. The most interesting figure however - is 35 units of the Honda Goldwing - the massive boat on two wheels. I believe Harley Davidson would be very worried about this one. Last edited by CrAzY dRiVeR : 27th January 2019 at 15:55. Ducati and BMW always play spoil sport every month with their missing numbers in the dispatch figures but some recent news provides insights into how the big German has performed in India in 2018. 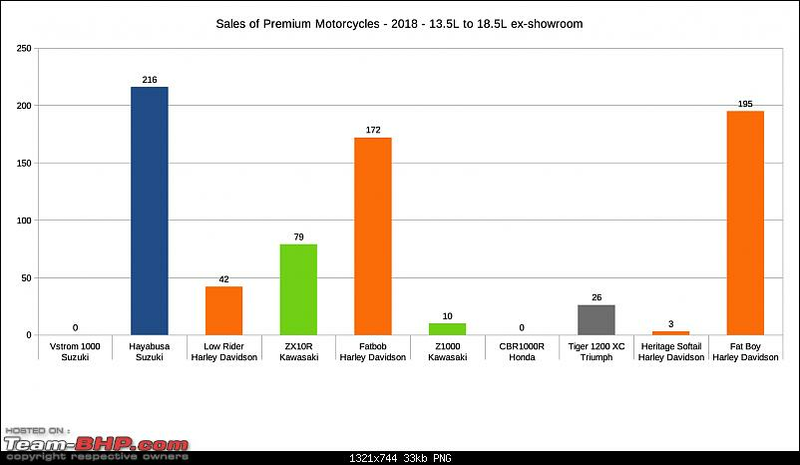 BMW sold (as compared to dispatched) 2,178 motorcycles in India with the entry level 310s contributing over 75% of the volumes. Assuming that the number is actually 75%, that means BMW sold only 544 units of their larger bikes as compared to 1,634 units of their 310s. 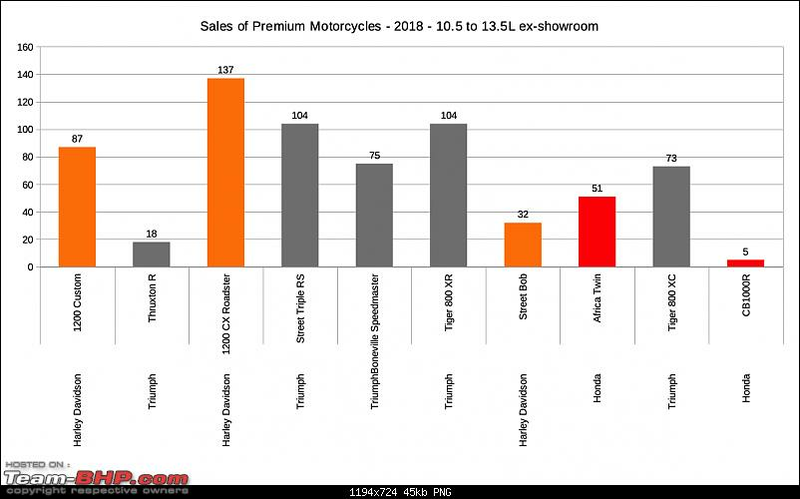 Although the figure is just an assumption from their press statement - it could put BMW Motorrad in 5th place in the market - ahead of Suzuki and Honda. Last edited by CrAzY dRiVeR : 27th January 2019 at 17:03. Thread moved from the Assembly Line to the Big Bikes Section. Thanks for sharing! Excellent data Crazy Driver. Many thanks for sharing this. Every month there have been debates on half baked data (read: monthly dispatches). This gives a very clear perspective for each product and each OEM. Harley's golden days are over i guess. The numbers they did in 2016 are just out of this world. I think they are facing the heat Globally and not just in India. Kawasaki is having a dream run and a well deserved one. They have gone product offensive and have taken the CKD route to offer mouth watering prices. Slower numbers for Versys 650 is a surprise as it is a very competent product and is priced exceptionally well. The Suzuki counterpart may have a better hardware but Versys has a very established name. Lets see how 2019 turns out to be for these two. Hayabusa is in a different territory all together, such an old bike that just refuses to loose its charm. The rock solid reliability and low maintenance is to be credited for such numbers. 35 units of Goldwing. Dont know what to say. A 30 lac rupee motorcycle bringing in such numbers is a testimony to the fact that we Indians can do anything for exclusivity. Extremely well researched and meticulously presented CD. The tidbits of info/ data and insights lend perspective to us otherwise uninformed readers. Good Show indeed ! Harley continues on top of the ladder, with its established name and the exclusivity factor. Also words like 'heritage' , 'history' and 'brotherhood' (that a certain Indian Company too is known to peddle much to its advantage) has helped them rake in the moolah. 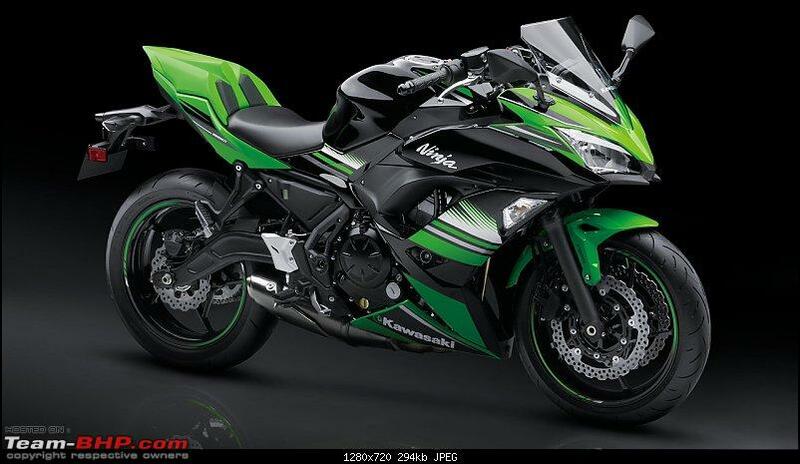 Kawasaki, of course is slowly inching up, with their varied products and excellent bikes. Now that they've reduced their spare prices for N300, maybe they'll see a spike in sales. Let's hope the practice is extended to their other products too. The dark horse, however, in all this remains RE. 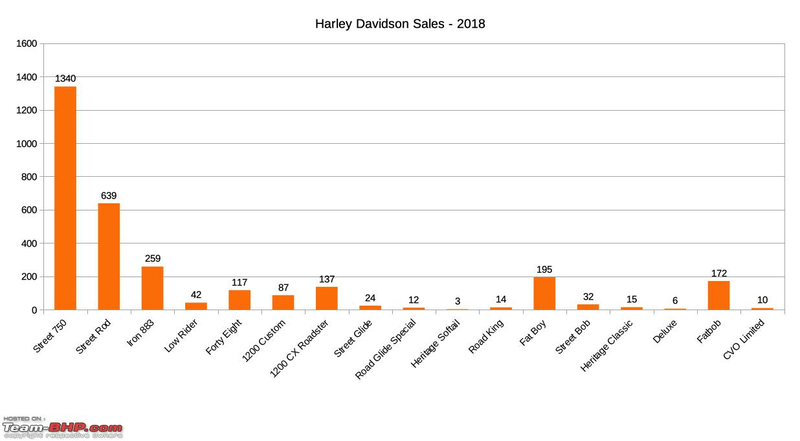 With their twins racking up serious numbers courtesy their astonishing prices, it'll be only a matter of time before they'll be knocking at Harley's door. Thanks for the wonderful compilation CD. The RE twins have worried Triumph and it is evident in the graphs. I am a little surprised seeing the sheer numbers of the Hayabusa and the Fatboy. These two motorcycles truly define opulence in their respective segments. 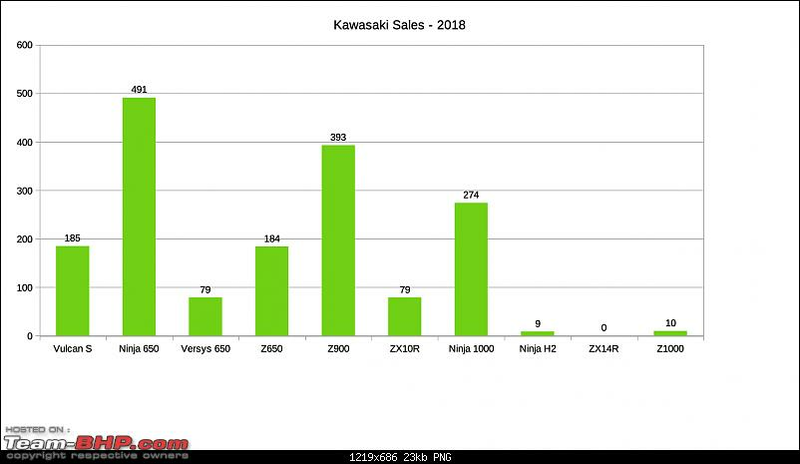 Its great to see the growth of Kawasaki. They have extended their Sales and Service presence in smaller cities like Kolhapur, Patna, Jammu etc and have got success due to their first mover advantage. I am sure the bigger KTMs will disrupt the sport naked segment. 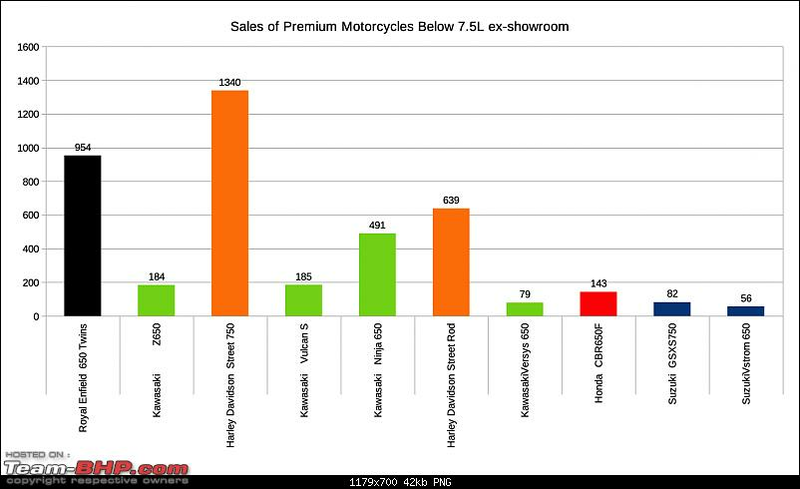 Also, it will be interesting to see the tourer segment market share after the Himalayan 650 rolls in.